Rye is a seaside resort town, approximately 83 km south of Melbourne, Victoria, Australia, on the Mornington Peninsula. Its bay beach is popular with swimmers, fishermen, yachtsmen, and kitesurfers. Its ocean beach (which is not patrolled) is also popular with surfers. 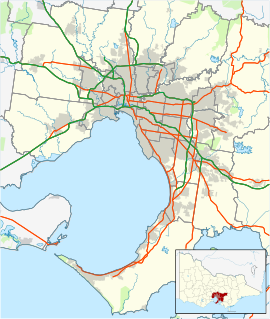 Its local government area is the Shire of Mornington Peninsula. Rye was proclaimed a town on 26 February 1861 and is partly in the parish of Wannaeue but mainly in the parish of Nepean, which is west of Government Road and Weeroona Street. The township went south to the southern boundary of the cemetery, with its east and west boundaries being Weir Street and Dundas Street. Suburban lots of 21 to 98 acres extended west to French St and south to a point just past the Golf Pde corner. Most of these suburban lots were bought by W.A.Blair, a Melbourne Lime Merchant. He also received grants for much land in the parishes of Wannaeue and Nepean. His objective was to establish a monopoly, which was only rivalled by John Cain. Many who had been engaged in the production of lime, such as Nathan Page, Tom Bennett, Edward Russell and Spunner, were dispossessed of their kilns by Blair in about 1867. Lime could be quarried throughout the area west of Boneo Road. Many golf courses and the Peninsula Hot Springs are on the sites of Limeburners' properties between Browns and Limestone Roads. An excellent reproduction of a lime kiln can be seen on the foreshore just east of White Cliff. They were built into the side of a hill so that firewood and napped limestone could be loaded from above. The town has a Lions Club and a Community Action Group which operates a Community Website to promote the town(www.rye.vic.au) In 2010 the Rotary Club merged with the Rosebud Rotary Club. These organisations are heavily involved within the local community. Rye also has a Historical Society which operates from the Old School House in Collingwood Street. Rye's summer carnival is located beside the pier carpark. The town is extremely popular during vacation periods, and has a varied selection of eating establishments. Golfers play at the course of the Moonah Links on Peter Thomson Drive  or at The Dunes Golf Links on Browns Road. Rye Pier is a popular recreational scuba diving shore dive site inside Port Phillip. Rye Pier is full of life and different every dive. Many juvenile marine life forms are found here as well as plenty of stingrays, spider crabs, squid and octopus. Seals often come in to Rye Pier from the seal colony on the nearby Channel Marker. There is also a marked snorkel trail for snorkelling children and adults. Rye Skatepark was the first ever cradle skate bowl built in the Southern Hemisphere opening in 2004, Rye is still popular with skateboarders. The Rye Fire Brigade is located in Collingwood Street, just behind the Bowls Club. The brigade has 3 appliances, a Pumper - used for structure fires, and Tanker - used for grass and scrub fires, and a Salvage - used as a support for both pumper and tanker. The fire brigade is volunteer-based and responds to calls in the Rye area and surrounding areas. Rye Brigade played important roles during Black Saturday sending trucks to Narre Warren, Kinglake, Longwarry and sending crews to Wilson Promontory. ^ Australian Bureau of Statistics (27 June 2017). "Rye (State Suburb)". 2016 Census QuickStats. Retrieved 13 April 2018. ^ Rye Ocean, St Andrews Beach, Beachsafe, Surf Life Saving Australia. This page was last edited on 5 December 2018, at 23:15 (UTC).